Amtrak's "Coast Starlight" is seen at first light with Mt. Shasta in the background as it heads north toward Seattle. The sun was just up and there was full light, for this image, and thankfully the train was a few minutes late. A 500 series "Pepsi Can" and a reliable old FP40 are a rare combination today, since mostly the Genesis engines are in charge. 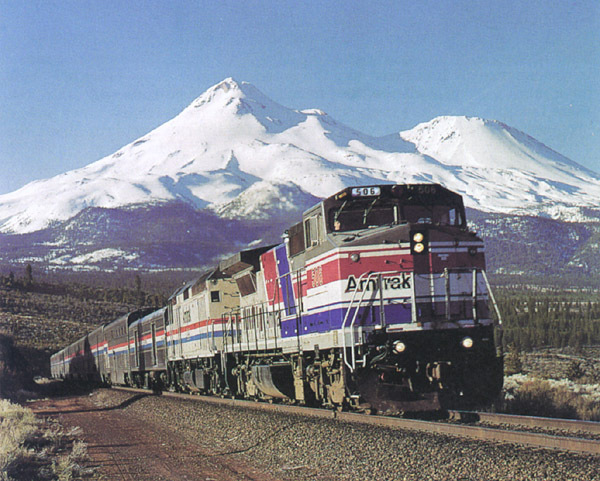 This image graces the cover of "America By Rail-The West Coast Route" which features this shot in the video as well, including shots from the train through this area south of Grass Lake, and north of Shasta, California. This images is from our 1996 catalog cover.